Maybe it was because I'd been on such a busy schedule -- so much fun this week with my simply mahhrvelous houseguest and dear friend, Brian. It was Brian's idea to go to the Rouault exhibit in the first place. Maybe it was that I expected too much. Maybe it was because Brian and I were running late after a festive lunch on the terrace at Le Grand Corona, and we kept poor Richard waiting. Maybe it was because the "museum" was dim and crowded and virtually windowless and hermetically sealed, and the stuffiness depleted my brain's oxygen levels. 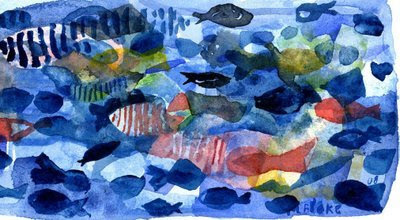 Maybe it's because I'm not big on clown paintings, and one or two were enough. Some good landscapes and nudes, though. Like I said, I dunno. But on Sunday when Richard and Brian and I made our way through the Rouault exhibit at the Pinacotheque de Paris, I started off chipper and enthusiastic, and by the time we finished 45 minutes later, I was champing at the bit to find the exit. Something about diminishing returns? I had been looking forward to checking out this relatively new boutique museum, since it didn't exist two years ago when I lived on the place de la Madeleine. Sunday afternoon when we entered there was a sizable crowd, mostly French, guessing from the banter I overheard. 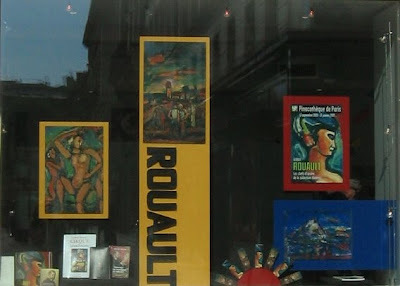 I didn't know much about Rouault, and for the most part left not understanding a whole lot more, but I did gain a newfound appreciation for Moreau, Rouault's maitre and mentor. There wasn't anything awful or unappealing, but somehow as I moved through the exhibit I became less and less interested in the artist and his work. I'm no art critic, so don't take my word for it. Just one subjective view of an afternoon which would have been better spent outdoors on a glorious September Sunday. Yeah, Richard had suggested going to the Parc de Bagatelle, and I nixed the idea. Maybe Richard thinks otherwise. Here's his view. I was flattered to be asked to write a 'light' piece for the quarterly publication of the Federation of Alliances Francaises in the US. It appears in this month's Federation Forum, and herebelow. I picked the topic and the not-so-clever title. Honestly, no bribes or other payments were transacted! It was my gift to a wonderful, worthwhile organization. Not everyone is lucky enough to get the opportunity to live in France. If you are a Francophile -- either budding or die-hard -- what are you waiting for? Sign up at an Alliance Francaise near you. Membership is one of the best investments you can make if you're searching for a certain je ne sais quoi in your life. Sitting at my desk in my apartment in Paris, I mull over what to write. I offered to pen a witty, lighthearted piece about the Alliance, and suggested the above title myself. My experience at the Alliance Française spanned some thirty years in Boston, as a member, employee, Board member, and member once again. In the late 1970s, with a freshly minted BA in French Literature, I arrived in Boston, looking for work. First stop: the Alliance Française, then located in a stately Beacon Hill mansion. The young woman at the front desk was welcoming and cordial, but clearly was not prepared to cede her beloved job to me; and except for the Director and the teachers, no other paid positions existed. But I eagerly shelled over the annual membership fee, and embarked on a life with the Alliance. Two years later, at the annual Bal du Printemps, the Director asked me for a spin around the dance floor. "Tiens, Polly," he said slyly. "Our assistant director is leaving. You wouldn't by any chance be interested in the job, would you?" I think I must have stepped on both of his feet as I stopped dead in my tracks and accepted. I didn't ask about compensation, benefits, hours. I just said oui. As I look back, my entire life has been shaped by my Alliance Française experience. Not just because I was a diehard Francophile who got her dream job, but because of what an Alliance Française is. The Alliance – every Alliance – is to me an important cultural anchor in a community where lives intersect, and French-American understanding flourishes, and lifelong friendships and associations are formed. I learned some important and some quirky life skills from the Alliance Française. Three years of monthly non-profit bulk mailings resulted in my acquiring the highly coveted and oh-so-marketable skill of memorizing every zip code in the greater Boston area. I learned to play the odds in the annual raffle and won the round-trip for two to Paris. (Hint: buy lots of tickets. Lots.) I met French cultural celebrities. I had breakfast with René de Obaldia and dinner with Jean-Jacques Sempé. Where else but at the Alliance could this take place? “Where else but at the Alliance?” could be the motto, the battle cry, of every Alliance Française in the US. Where else but at the Alliance would a desire to advocate for the importance of foreign-language learning result in a correspondence with Senator Paul Simon? Where else but at the Alliance would I have the opportunity to accompany the Deputy Mayor of Paris at Boston’s Great Cities of the World Conference? Where else but at the Alliance would I have made contact with other groups that advocate for Franco-American friendship, such as the Lafayette Society and a number of Sister-City organizations? Where else but at the Alliance Française would I be inviting (badgering!) the Boston press corps to follow a Rochambeau re-enactment regiment or to cover a tropical Mardi Gras party in the midst of a blizzard? And now, here I sit in my apartment in Paris. I couldn’t have done it – this move to Paris – without the Alliance. Had I not taken the business French courses, for example, I’d be sunk. I use those skills, ahem, every day, like it or not. Opening a bank account, dealing with plumber’s bills, writing to the lawyer, the landlord, the notaire. Ah, the bureaucracy that I correspond with. Merci, Alliance -- couldn’t have done it without ya! Although I’d love to live in Paris forever, who knows where I’ll end up settling permanently. But this I do know. 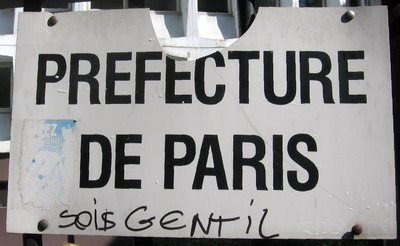 If I return to the States, I will move to a town that has an Alliance Française. Honestly, I really believe that a town’s having an Alliance should be a criterion for those “Most Livable Cities” surveys published annually. Don’t you? Where else would you go? Where else but where there’s an Alliance Française? En route from the Viaduc des Arts to the Gare de Lyon today it was impossible not to be blown away by the cerulean blue of a clear September Paris sky. 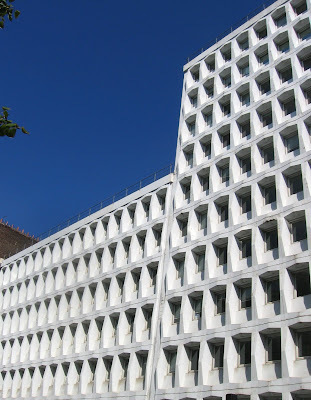 The stark architecture of the Prefecture de Paris building (in charge of housing), on rue Paul-Henri Grauwin, set a perfect visual contrast. But I really liked the graffiti on the sign on the gate outside the Prefecture. Okay, I wasn't kidnapped by aliens. I haven't posted in a while because I was away in the US getting fired up for the November elections. And other stuff. Anyone in Paris, any age, who is fired up and wants to watch the Presidential Debates (Will they or won't they? Stay tuned...) can join the Young Democrats and Young Republicans of Paris at Carr's on 1 rue du Mont Thabor in the 1er arrondissement at three o'clock in the morning -- late Friday night September 26th/early Saturday the 27th, depending on how you set your clock. All ages welcome, as long as you can stay awake. Also, not to be missed: the Vice Presidential Debates, at Carr's at 3 a.m. Friday October 3 (Thursday evening the 2nd in the US). My daughter called from her college in South Carolina. Anticipating Hurricane Hanna's arrival, she went to check on her car, which was parked next to the Harris-Teeter supermarket. As she was closing the driver's door of the old Volvo, a woman approached her in the parking lot. 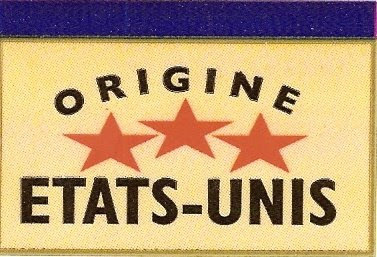 "Vous êtes Française?" inquired the woman, who apparently had spotted the "F" bumper sticker on the rusted rear end of the car. "Oh... no, I'm actually not," replied my smiling daughter. "But my mom lives in Paris, and she got me this sticker." "Ah zen," reprimanded the woman officiously. "Eef you ahr not really Fraench you should not put zat steeker on your cahr!" Francophile that I am, I've always plastered an F sticker on my car in the US, to the exclusion of all other bumper stickers. I used to buy them at service stations on the autoroute in France. That family tradition continues. Or did. How to nip a potential Francophile in the bud! Now the F is more of a nostalgia item, I guess. But should the F sticker be reserved only for cars of French citizens living in the US? It's the automobile sticker that launched a thousand imitations. 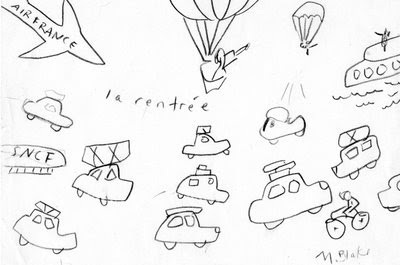 If you want the (real) thing, you can find bumper stickers and similar fun French stuff here. When I lived in New England, I saw a bumper sticker proclaiming, "Whoever Dies With the Most Fabric Wins." I slapped my thigh and gurgled in glee. Ha-ha-ha. Then I froze. Paranoia struck. How did They know about me? Had someone been snooping in my attic and uncovered my cache of 20 years' worth of miscellaneous fabrics "that I might do something with some day"? Then the happy realization, of course, that I simply was not alone in my textile-acquisition passion. Er, addiction. I have always been so drawn in by the infinite possibility of cloth. I was already sewing my own teeny-bopper mini-skirts using leftover slipcover material by the time I was 12. And my dorm room one year had an entire jungle wall of lions and tigers hanging in floor-to-ceiling panels of 1970s sheeting fabric. Those nascent artistic flames of fabric creativity were later fanned by years of purchasing Marie Claire Idées whenever I got my hands on a copy in the US. Creative nirvana. After decades of accumulation, I eventually dispatched with all those cool fabrics, either in clever creations, or ultimately, by donating all the rest to the local Episcopal church rummage sale. I had purged the fabric. Hurrah! It freed up a lot of brain space not to be hanging on to all that stuff. All those maybes. And I made a new vow: no more textile hoarding for me! Then I moved to Paris. And I discovered the Dreyfus Marché St. Pierre, in the eponymous textile quartier of Montmartre, which is where you must go if you want to win that contest. Six storeys of every kind of fabric that you can imagine. Prices all over the map, but always a bargain for what you get. And if you don't find what you want at the Dreyfus store, the smaller shops cramming the nearby streets abound in colorful, exquisite textiles at the most remarkable prices. Gabardines, silks, taffetas, flannels, jacquards, muslin -- you name it, it's all here. 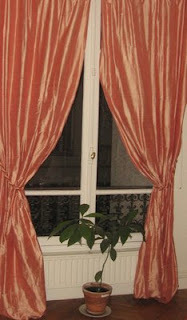 I found pricey salmon-colored Lyon silk that I couldn't live without to use for curtains, and hung them up without sewing a stitch (I don't have my sewing machine in Paris). Clips, hoops a curtain rod: voila! The light they cast in the living room is sublime. I snatched the last 10 meters of a bolt of beribboned polyester satin/silk that looks every bit as expensive as that soie de Lyon, but at one-fifth the price. It's dusty rose and kind of girly-swirly, so it became bedroom curtains. Around the corner from Dreyfus at a little mercerie, I bought the curtain tie-backs for 3€ apiece -- compared to a 15€ price tag in department stores. I also found close-outs on silky tassels which now hang from keys on closet doors and also my key chain: 1€ each. Every time I set foot in Montmartre, I was inexorably drawn to the Marché St. Pierre, and I always came home with more fabric. A meter of exquisite embroidered silk to throw over the plastic boxes masquerading as a coffee table. Umpteen meters of a poplin with enormous yellow flowers that I simply had to adopt because it was only 1€ per metre. Perhaps I'll make a tenture murale, I dreamed. A perfect checkered waxed cotton that will make a great table cloth. Someday. Finally I had to do a one-on-one self-to-self textile intervention. No more visiting the Marché St Pierre. Anymore! The temptation was greater than my oh-so-weak willpower. Instead of "Think of England!" my stoic cry was "Think of storage space!" The fabric ban lasted almost a year. Then this week a dear fabric-addict American friend was in town, so I returned to le Marché St. Pierre. Just to show her around, of course. Aw heck, there are greater sins than acquiring non-essential fabric. Right? 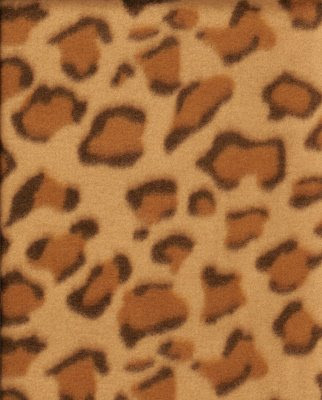 I returned home with leopard-print polar-fleece -- enough to make two throws. 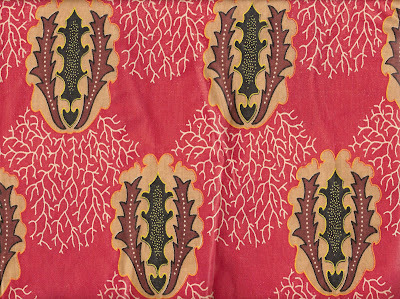 Some cool African-print cottons for 2€50 per meter. I took note of some Toile de Jouy I'd love to put in the living room alcove. A delicious butter-yellow Provencal print that I could make into aprons for Christmas presents. Some tulle I'd love to use for wrapping small gifts. That floaty batiste could surely be used somewhere. And...and...and. I am lost in a another world. I wonder. Is it just a coincidence that St. Pierre is French for Saint Peter? The doors to this fabric emporium are not exactly pearly gates. But fabric lovers crossing the threshold here really feel as though they've died and gone to heaven. Warning: if you're squeamish or vegetarian, you might not want to look at the rest of this post. I won't say that this sight is an everyday occurrence in Paris. On the other hand, not unexpected or unusual. 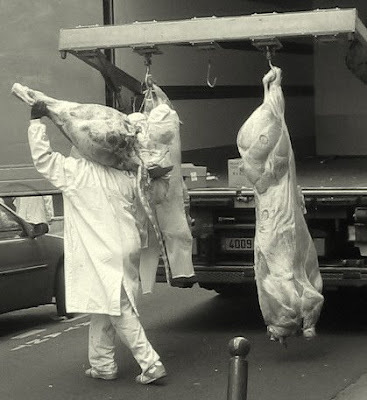 The only difference was that the butcher's truck was stopped on a side street in Montmartre, blocking traffic. I was walking up the sidewalk and just snapped the shot. I transformed the photograph to black and white to make it artsier and somewhat less ... direct? "The French have returned to Paris en masse. The pale comatose tourists drinking liter mugs of beer on café-terrasses have been replaced by Côte d'Azur tans and enthusiastic chatter. It has always been an exceptional moment in this gray city of light."